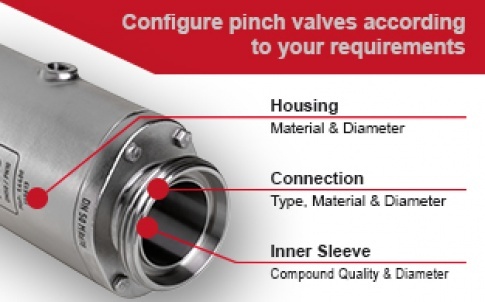 On our website, we provide special pinch valve configurators that allow you to quickly and easily configure pinch valves according to your requirements. Select housing and connection materials, nominal widths and connection types as well as sleeve qualities. You will immediately receive an article number of your pinch valve and you are able to request this in the same step. Our configurators are available in 16 languages and can be found under the respective connection types of our series. To learn more about our products, feel free to visit here for more details. If you have any further questions, feel free to contact our sales and support team. AKO Armaturen is a specialist in the manufacture of pinch valves and a producer of various valves such as air-operated pinch valves, mechanical pinch valves and knife-gate valves for use in the industrial sector. Due to the versatile usability of fittings, AKO has prevailed as the European leader in air-operated pinch valves to this day. Through consistent and innovative research and development, AKO can offer products for almost every industrial sector and provides users with a reliable and safe solution. How does an AKO pinch valve work? Pinch valves work by the controlling the medium of air pressure or water being used between the pinch valve body and the sleeve to give 100 per cent closure of the pinch valve. Exhausting the pressure causes the pinch valve to open. When open, the sleeve is a true bore allowing unobstructed medium to flow through. The maximum operating pressure is dependent on the nominal diameter and is around 2–6 bar. All products from the AKO portfolio have received the certificate according to DIN ISO 9001:2008. AKO has demonstrated its high quality worldwide for many years. Please do not hesitate to contact us and make use of individual consultations with our pinch valve experts.